Infinite Art Tournament: The 5000s at War: "Rivals of Catan"
Only problem is, it requires a minimum of three players. What are you to do if there are just two of you rattling around your castle and you feel the need to use grain, wool, lumber, and bricks to found a settlement? 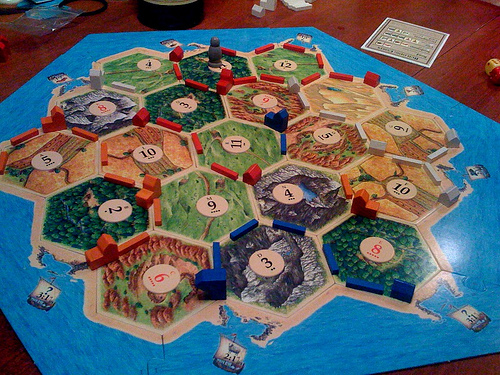 Well, I recently bought a two-person Catan game on impulse at the City of Books. And it has turned out to be kind of awesome! Rivals is kind of a card game -- at least, it's played with a variety of cards -- and indeed, might be kind of a grown-up version of Pokemon, except I never played Pokemon so I don't really know. Anyway, some of the cards represent your settlements, the roads in between them, the buildings and leaders living in them, and the surrounding countryside. Here's my kingdom at the beginning of a game, with Mrs.5000's competing turf over across the range of draw piles. I've got two villages connected by a road, and then an assortment of terrain that will, with any luck, be generating me some resources. I've also got a handful of cards. Some of them are actions that can benefit me or annoy my lovely helpmeet, and some of them are buildings, ships, or people I can place in my settlements by spending resources on them. They are kind of purty. The terrain cards have a cool mechanic whereby you keep track of your resources by rotating them. In this case, I have one unit of wool. If I get another, by rolling a four or otherwise, I'll rotate the card counterclockwise so that two sheepies are pointing towards me. If I spend a unit of wool, I'll rotate the card clockwise. Neat. But in this case, Mrs.5000 wins in the end. Rivals was a bit dear at ~$25, but represents good value for money if you are into this kind of thing. It has well-tuned game mechanics, with a good balance of strategic thinking and blind luck that creates, well, fun. Also, the basic set actually contains five related games. There is a relatively simple basic game, three expansion packs that add considerable depth, complexity, and spin, and a free-for-all that incorporates all three expansion packs. After a month or so of frequent play, Mrs.5000 and I feel like we have a modest grasp of the basic game and only a tenuous understanding of the first expansion set. It will be a while before we're ready to advance to the second expansion. So, since the box really turns out to contain five closely related but distinct games -- or at least "gameplay experiences," to flash a little game-geek jargon -- the kit really pencils out to a bargain five bucks a game. Prognosis: Excellent stuff if you are into strategy games but do not wish to be staring at a glowing screen! "Rivals of Cataan" has really cut into my Shakespeare-watchin' time. But I'm sure nobody's too cut up about that. Is this kind of a home-ier Risk? This is a much, much more complex, fun and challenging game than Risk, or any of those board games you'd give an eight-year-old on a rainy afternoon. And I'm pleased to announce that I finally won again last night, after M5K's 3-game winning streak. It's a very finely tuned game--luck is just important enough to take a little pressure off the strategic heavy lifting--so you can play for over two hours and get to the goal just one turn ahead of your opponent. Best of all, you play on a table! Such a charming use of old-world technology!